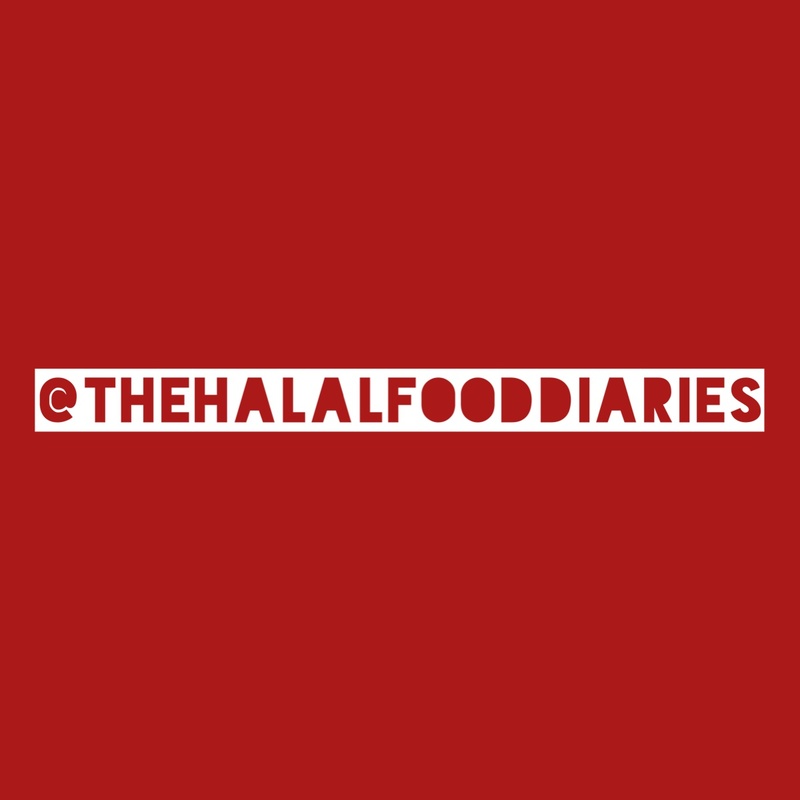 The Halal: Fully halal HMC certified burger joint in East London. No pig and no alcohol! 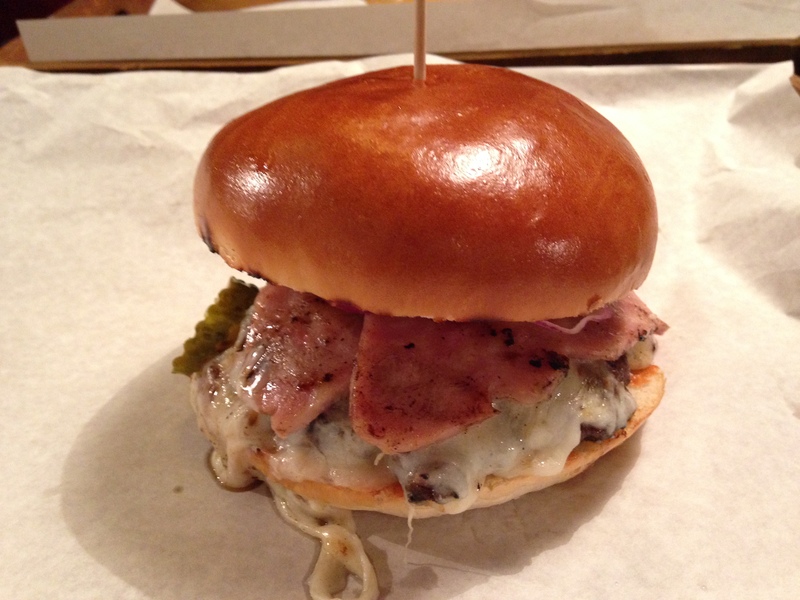 The Place: Hidden on Cavell street, a Whitechapel back alley is East London’s most awaited burger joint. Let’s face it we’ve been pining for a local shack following the unveiling of halal burgers diners north, west and south of the river. 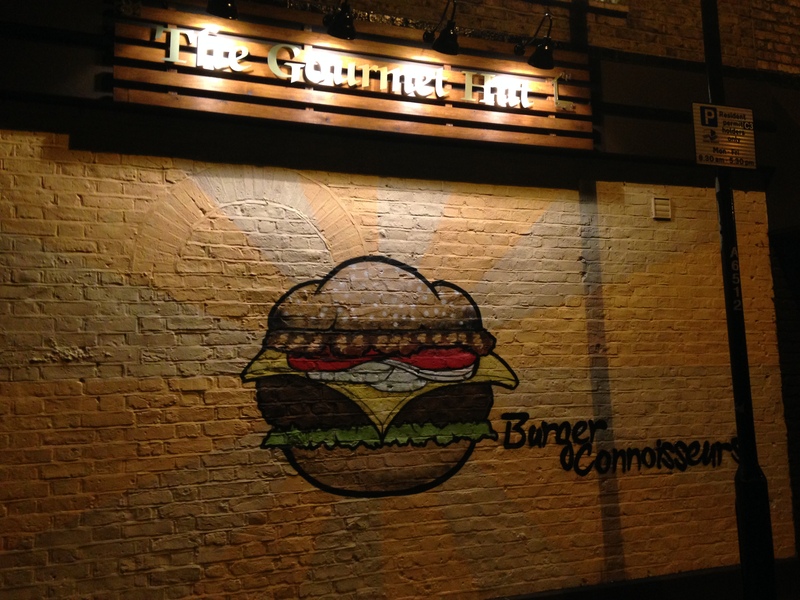 I particularly loved the street art giant burger sprayed on the brick wall outside! 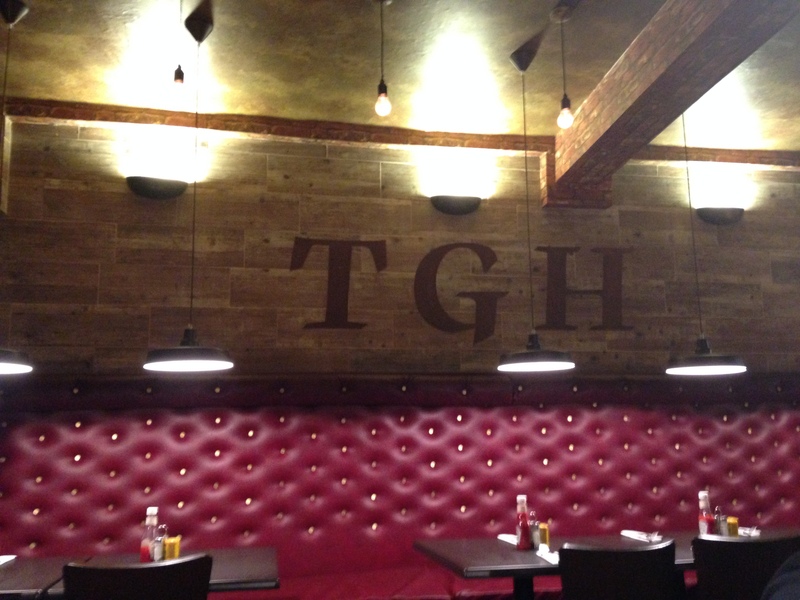 The inside of the restaurant was a bit dark with urban lighting and deep red leather sofas punctuated with £1 coin buttons. 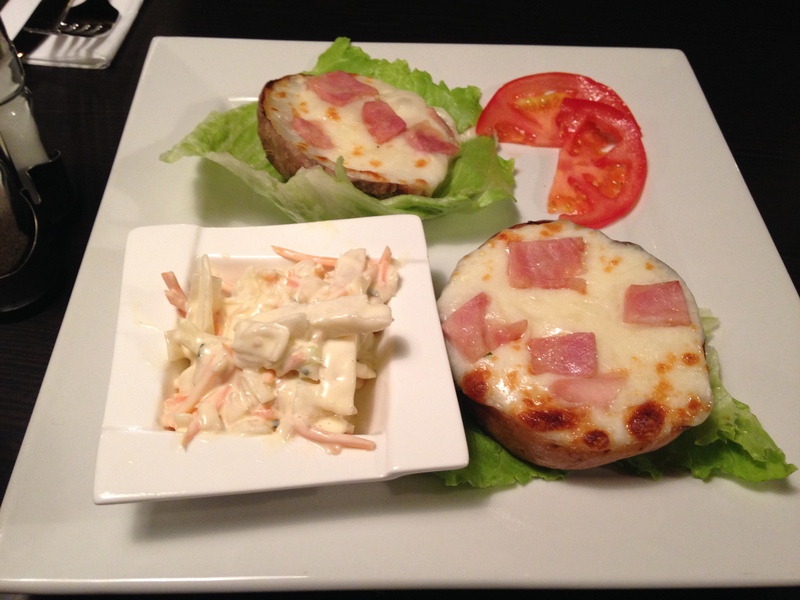 The Food: You’ll find the usual selection of appetisers: chicken wings, nachos, loaded potato skins, scampi and so on. We were intrigued by the loaded skins but somewhat disappointingly were given two large skins (or a jacket potato cut in half) loaded with excessive cheese and a few flakes of Turkey bacon. The burgers came in very sweet rustic wooden trays. The brioche buns were enormous and the sheer quantity of bread distracted the eater from the filling. Saying that the brioche was very fluffy and soft. 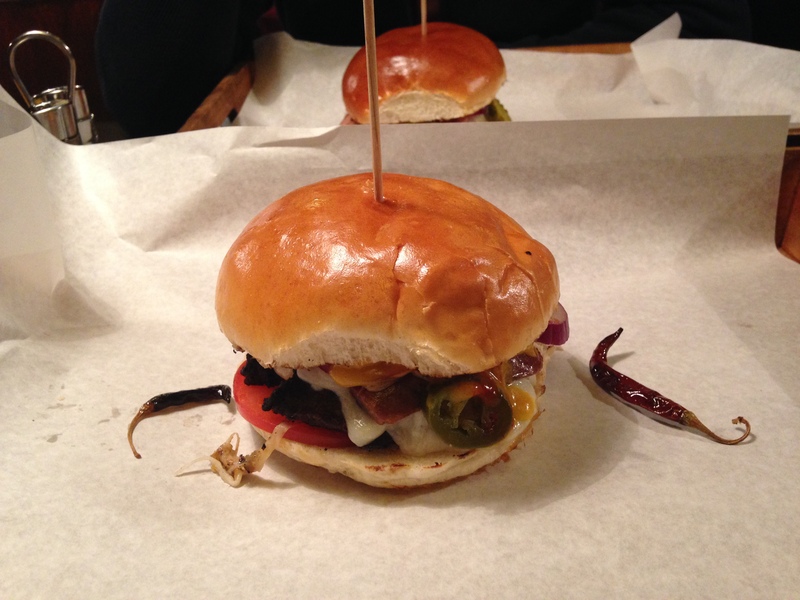 The Firecracker was a spicy beef burger with melted cheese, jalapenos, sausage, onions, tomato and HM chilli sauce. Overall the burger was a real fire starter (in my mouth!). As is usually the case, the burgers cannot be eaten delicately… Approach with carnivorous intent! The smoky barbeque burger was slightly less impressive in its flavour. The burger had all the ingredients to be successful: gherkins, bacon, barbeque sauce and cheese however the beef did not taste particularly smoked and the sauce-o-meter could have been ramped up a notch! There were also non-beef options such as a lamb, chicken and even a fish and chips burger! The chips were crispy and tasty and the coleslaw was creamy and delicious. The Price: You really can’t complain at around £15 per person for a gourmet burger, sides and drink! The Verdict: I must inform readers that we dined at the Gourmet Burger Hut in the first week that it opened so I suspect many of my comments may have been related to teething problems. The staff were delightful and went out of their way to ask if they could improve our experience. That to me shows a restaurant that is willing to listen to its customers and improve with the feedback given. So I will definitely be giving the Gourmet hut a second shot! I recently found out about this place through a relative of mine. I have been here twice already in the span of a few days (literally in 2 days). This place is amazing. Its slightly difficult to spot but honestly the decor is beautiful and relaxed (vintage type of scene), the food is amazing, the staff members are ridiculously even more amazing, the whole vibe of this place is brilliant. I initially tried the firecracker burger which lived up to its name and 2 days later I went for Mr. Simpleton (names are kind of cool, ain’t going to lie). I will gladly recommend this to anyone and everyone.